This internationally-acclaimed documentary explores the inspirational journey of the Tūhoe people as they create a 'living building', an environmental exemplar hub for their community. Discussion and reflection after the film on the journey ahead for the Christchurch Enviro Hub, as we aspire to create our own environmental centre in Greater Christchurch. 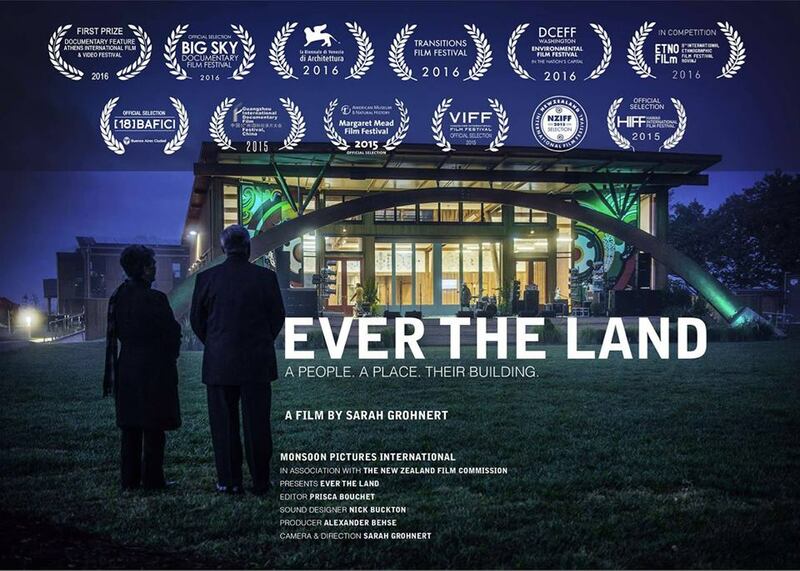 EVER THE LAND explores the sublime bond between people and their land through a landmark architectural undertaking by one of New Zealand’s most passionately independent Maori tribes, Ngāi Tūhoe. The setting is the forest region of Te Urewera and Tūhoe are an indigenous people fighting to rebuild and to claim their rights. For the past 150 years, the relationship between the Tūhoe Maori tribe and the New Zealand government has been defined by longstanding grievances over severe colonisation experiences such as illegal land confiscations and the devastating consequences of scorched earth policies. The film captures a period of change and tremendous foresight: Tūhoe are negotiating an apology and settlement from the Crown, and constructing an architectural gem of a community centre using radically sustainable methods. Tradition and environmentalism are brought together, and the film gives us a stirring depiction of Indigenous pride. The new building is the binding character in this observational documentary that immerses us in a culture that is tightly woven into its land and an architecture that is defined by its integrity to it. This is a film about past and future, tradition and modernity. Most of all, though, it’s about the grandest hopes—and what it takes to fulfill them. Doors open at 6pm, screening commences at 6 30pm. Food and drinks are available to purchase from the XCHC cafe/bar. Credits to: Director Sarah Grohnert, Monsoon Pictures International, and the people of Tūhoe for allowing this screening.